During the eighteenth century young men of rank and fashion finished their education by traveling on a Grand Tour of Europe. Venice, a favorite destination, was admired for its charming location and splendid architecture. Souvenir pictures, topographical depictions as wall as imagery vedute ideale, were in great demand. One of the most successful artists in these genres was the painter Giovanni Antonio Canal, known as Canaletto. Canaletto began his career as a set designer, but by 1730 he had come to the attention of the British collector, art dealer, and future Venetian Consul, Joseph Smith, who became his chief patron. 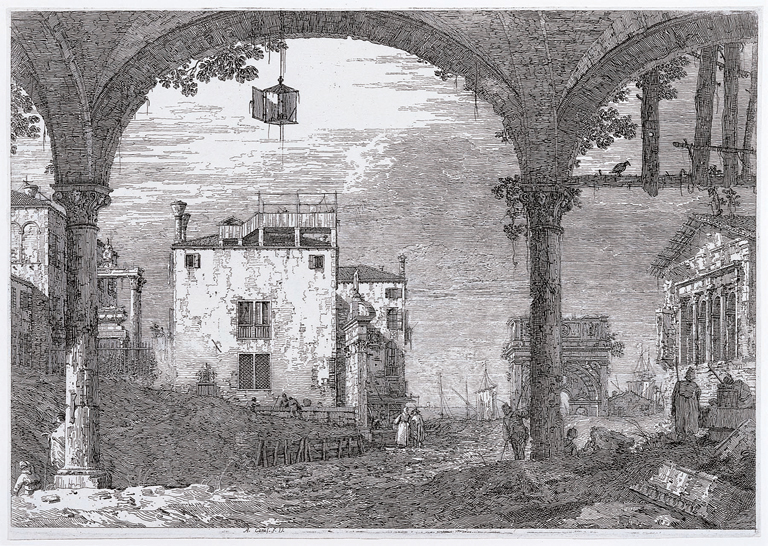 When the outbreak in 1741 of the War of the Austrian Succession brought tourism in Venice to a virtual halt, Smith continued to support Canaletto with commissions and, most notably, encouraged the artist to take up etching. Although Canaletto made only thirty-four etchings, he handled the medium brilliantly. Avoiding the convention of cross-hatching to produce shadows, he drew parallel strokes with the etching needle and left prominent areas of blank paper in his prints to convey a sense of the region's brilliant light. A number of his prints, like his paintings, represent actual Venetian sites, but most are highly imaginative landscapes of the Venetian lagoon and mainland. The Portico with the Lantern is one of Canaletto's most fantastic compositions. He transformed the city's flat site into multilevel world with abrupt depressions and craggy prominences replete with crumbling temples and monuments that are more typical of ancient Roman architecture than the vernacular Gothic of Venice. It speaks of the romantic fascination of the times for classical culture - Herculaneum, sister city to Pompeii, had been uncovered only a few years before - and the current notion that invention and fantasy were the heart of artistic genius. Excerpt from Building A Masterpiece: Milwaukee Art Museum. New York: Hudson Hills Press, 2001, p. 183. Entry by Terry Marvel. Milwaukee Art Museum. Building a Masterpiece: Milwaukee Art Museum. New York: Hudson Hill Press, 2001, p. 182, color illus. Goldstein, Rosalie, ed. Guide to the Permanent Collection. Milwaukee, Wisconsin: Milwaukee Art Museum, 1986, p. 52, b/w illus. p. 52. Views of European Capitals: Piranesi, Meryon and Their Contemporaries in Italy and France, Master's Thesis exhibition, University of Wisconsin-Milwaukee Art History Gallery, Milwaukee, April 23–May 14, 2009. Fine Prints from Five Centuries, Milwaukee Art Museum, October 1–November 28, 1993. Bruegel to Hockney: A Decade of Print Aquisitions, Milwaukee Art Museum, November 9, 1990–January 20, 1991.